It’s January. It’s a new year full of new possibilities. Want to know the fastest and most effective way to unlock those new possibilities? It all starts with the way you think. Yes, the way you think. The truth is, you can write down a list of goals that will set the world on fire, but if you are still stuck in the same old self-defeating thought patterns, it’s likely those goals won’t be reached. Why do you think most people fail in their “New Year Resolutions”? There are a number of reasons, but one of the biggest is trying to insert new actions into a life with old, stale thinking. The bottom line is that if you learn to think differently and imagine new possibilities, that change in thinking will enable you to get some serious traction on those goals. 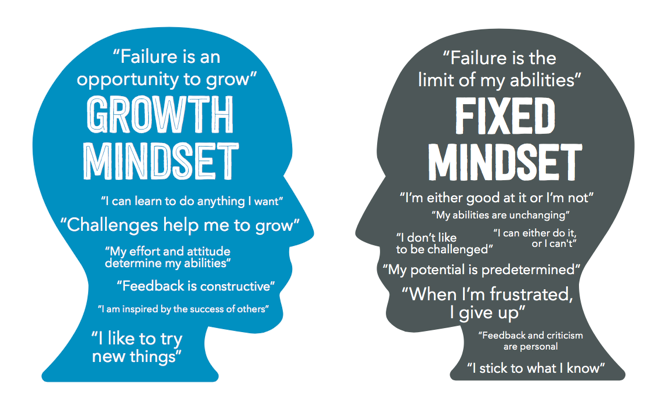 In her book, “Mindset”, Carol Dweck writes brilliantly about what she calls the ‘fixed mindset’ versus the ‘growth mindset’. Understanding these mindsets and adjusting accordingly, may make all the difference in how effective and satisfied you are in 2018. First, let’s look at the fixed mindset. This is a mindset that believes intelligence is static. People in this camp believe “they are the way they are”. They see no real hope for any significant development of who they are. Now, it’s important to say that believing this is believing a lie. But, simply saying this is a lie and don’t believe it is not sufficient. Let me explain why you must work to get out of and stay out of this fixed mindset. Although people with a fixed mindset generally believe they are the way they are, this does not mean they have less of a desire for a positive self-image than anyone else. So, of course, they want to perform well and look smart. This desire, coupled with the fixed mindset, leads to some negative tendencies to be front and center. Just to name a few, people in this space tend to avoid challenges, give up easily when facing obstacles, see high effort as generally fruitless, ignore useful negative feedback and feel threatened by the success of others. As a result of these patterns of behavior, they may plateau early in life and achieve less than their full potential. This, of course, ‘confirms’ their deterministic view of the world. Now, let’s contrast this with the growth mindset. People who hold this mindset believe that intelligence can be developed, that the brain is like a muscle that can be trained. This leads to a desire to grow and improve. Unlike their fixed mindset counterparts, these people believe their self-image is not tied to success or how they look to others. For them, failure is not something to be avoided, but an opportunity to learn and grow. So whatever happens, they win. Generally, people in this mindset embrace challenges, persist in the face of setbacks, see effort as a pathway to mastery, learn from criticism and find lessons and inspiration in the success of others. All this gives them a greater and greater sense of free will. So, it should be clear that the growth mindset is greater than the fixed mindset in every way. However, this is real life and we all know that almost no one will have a 100% fixed mindset or a 100% growth mindset. Most of us have some of both going on simultaneously. If you’re hoping to operate in a growth mindset that may sound like bad news, but remember, free will is a gift at your disposal, so it is very possible to develop a worldview that’s ever-evolving from more of a fixed mindset to more of a growth mindset. This is true even if you are on the older side of life and are “set in your ways”. Dweck’s research indicates that both children and adults of all ages can be taught to change their mindsets. This is where a good coach can help you in 2018. When you’re ready to get started changing that old self-defeating mindset, a great step is to get engaged with a coach who will challenge your thinking, ask you the hard questions and help you learn to think differently and imagine new possibilities. Here’s to a happy and growth-filled new year!